Published by Exposure Publishing, December 2006, ISBN 1846855373. After so many obstacles, my book is finally out. I could not believe it when I opened the Diggory Press/Exposure Press web page and saw it. Even more unbelievable has been the response, e-mails from people telling me that they have placed orders have been overwhelming. And I haven't even started to tell the world. That feeling that I often get, that no one really gives a monkey's what I have to say? I don't have it right now!!!!! Praises to the Most High Rastafari for making this project happen. The Man who turned in to a Rastafarian is probably the only work of fiction that explores the reality Rastafarian presence in Zimbabwe today. I must make clear that most of it is based on observation, there is very little autobiographical material in the stories. I know Gilbert, my friend, will be furious to see a match-making character named "Jerome", but I could not help myself there. Marriage has done things to his psyche, I had to immortalise the man he was for posterity. I had a talk on the phone with my friend Hloni, and she tells me that unless my book is chosen as a literature set book in schools and colleges, I don't have a prayer as an author in Zimbabwe. Well, it is not going to be chosen as a set book in schools and colleges, that is a foregone conclusion that has nothing to do with a lack of confidence. Should this project be a success, I could actually be able to tell the rest of the writer fraternity how to make it with the aid of the Internet. And, having made a bit of cash, there are one or two really talented but underprivileged writers that I would like to lend a hand to. Please have a look at my book, and tell me what you think. I would like to see the independent bookstores take it on as well. 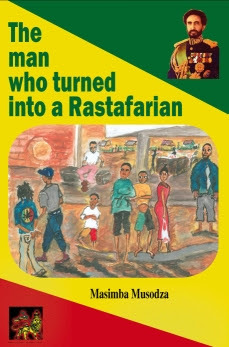 The Man who turned in to a Rastafarian is available directly from the publishers and from the following online stores. And there have been a few reviews, notably on Rastainoz . South Africa from Kalahari and Loot. Plans are underway for editions in other African countries. Hello Masimba. I'd like to congratulate you on your succes in getting a book on the reality of Rastafari published. I can't however see it anywhere on Amazon. Well, I hope you'll be writing more books on this subject in the future and I think I'll enjoy them. Please visit me on my modest blog at http://nattydreadlock.blogspot.com/and tell me what you think about it by leaving a comment. Please share your thoughts on His Impereal Majesty, Emperor Haile Selassie I, and on your visions and hopes for the African continent. I'm looking forward to reading your comment. Jah bless, Jah Rastafari!!! hello, i can't wait to read this book ... and am very thankful for it. I've found it definitly on barnes & noble, but haven't tried amazon.. I think the whole world needs more books like this, just from my own small misundersanding here in america even, people do not know much of rastafari and what they do know is usually very wrong, one time where i work everyone was talking about what religion they were and I was really quiet just listening most of the time and then finally I got up the courage and said "I am a Rastafarian." Why did I have to be afraid when they weren't afraid to express their religion or non/religion,etc... they all just turned and stared at me kind of shocking like and became quiet, and some laughed. I know the feeling, even before you encounter the disapproval you have to muster a lot of courage to say, "I am a Rastafarian". But afterwards, you feel defiant. The feeling about being misunderstood, well it seems that one is never going to go away unless you live in area where there are many likeminded folks. I became a wonder to many, the Psalmist says. Have you tried advertising your book on Rastainoz.com? Also how can I purchase your book if I dont have a credit card? I'm sorry for not having seen your comments earlier, and many thanks for the enquiry. Wherabouts are you geographically? Please e-mail me on masfin@gmail.com and we'll see how to get a copy to you. I am working on Rastainoz.com, there will even be a review.